Labour’s Member of Parliament for Stockton North, Alex Cunningham, has given his support to a campaign which aims to give a voice to the millions of people supported by benefits at some point in their lives. Polling by the campaign, Who Benefits?, has revealed overwhelming public support for the principle that benefits should be there for those who need them. 81 per cent agreed that ‘benefits are an important safety net to support people when they need help’, while almost two-thirds agreed that ‘we all benefit as a society when support from benefits is available for those that need it’. But despite widespread public support, 27 per cent of those who currently claim benefits say they have hidden this because of what people will think. This rises to 47 per cent of 16-24 year olds supported by benefits, while more than half of those who had never been supported by benefits said they would feel embarrassed to claim. The Who Benefits? campaign, launched by more than 70 charities and community groups brought together by The Children’s Society, Crisis, Gingerbread, Macmillan Cancer Support and Mind, argues that the overwhelming majority of those on benefits really need the support, yet too often their voices are ignored, misrepresented or at worst they are blamed for their situation. 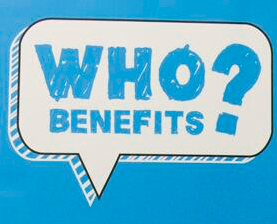 As part of Who Benefits? a thousand people who have been supported by benefits have already shared their stories, and Alex is encouraging others to share their experiences through the whobenefits.org.uk website and through social media with the hashtag #WeAllBenefit. Leslie Morphy, Chief Executive of Crisis, said: “At Crisis we see every day how support from benefits lifts people out of homelessness, or prevents them from ending up on the streets in the first place. With this support we see people moving into work and on to a better life. Yet all too often the realities of people’s lives and situations are just ignored.